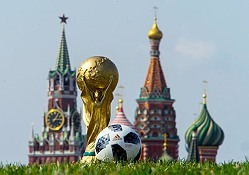 Eutelsat provides satellite transmission capacity for FIFA World Cup in Russia. Paris, June 2018: Eutelsat has announced that capacity equivalent to 5,500 hours of High Definition (HD) transmissions has been booked by several TV channels and service providers for the global event to be held from 14 June to 15 July. In addition to the regular broadcast capacity booked by Eutelsat’s customers, capacity on five Eutelsat satellites will uplink signals from 11 cities across Russia during the month-long event. Delivering content to television networks based in Europe, Russia and the Americas, the event showcases the essential role satellite plays in providing global coverage, particularly in key international sporting events. Eutelsat’s satellites form part of the broadcast infrastructure mobilised to enable millions of viewers to benefit from a wide-range of content, including not just the football matches, but also pre- and post-match interviews, coverage of team training, and the daily life of soccer fans.